In this New Year of new beginnings, may these kitties have all the health and happiness in their forever homes! We'll miss them but they'll always hold a special place in our hearts. According to the Feline Intake and Adoptions Supervisor at PAWS, "Benjamin’s new mom wants to thank us all for trusting her with such a wonderful companion. She lives in a townhouse on the water and has set up a viewing platform for him so he can sit and look outside and, in her words, fantasize about catching all those seagulls. He talks a lot. He and her other cat, Dr. Mell are still working out their relationship. She says that Benjamin is 'always on the move ... he roams all over the house and seems to love it.'" Hassie's people wrote to let us know that "...she is incredible! she has become an important and special part of our family and we love her so much. Thank you so much for bringing her in to our lives. She loves to snuggle under any warm blanket that she can find. When she isn't sleeping, she is playing with one of her favorite toys which would include a glove that we got that has all of these little strings at the end. She is the puurrrfect pet for us!" Wishing you and your furry friends and families a joyous holiday season. Thanks for your friendship, and for following our Blog! Hip hip hooray for our buddy Tay! Those of you who've been following our Blog for a while may remember Tay, the adorable pure white kitty (who just happens to be deaf) we wrote about back in February. Well ... we thought you'd like to know he was adopted this past Saturday. :) We're so happy for this sweet and playful guy. And why wouldn't we be? After all, Tay received the thing at the very top of his wish list ... a forever home and people of his very own. Be well, Tay. We love you! Back in March, we posted an entry about Benjamin, the handsome, shy and incredibly sweet orange tabby with a penchant for scratches under his chin. During his time at PAWS, Benjamin won a place in our hearts with his gentle and unassuming nature. Well, with the holidays nearly upon us, we're happy to report that this wonderful guy has found his forever home with people of his very own. What a fantastic holiday present! Enjoy your new home, Benjamin. We love you! An adorable face (and personality to match)! It seemed that perhaps coming directly to the shelter was a little too much, too soon for Frankie. So a very kind volunteer fostered him for a while so that he could get used to people and living with other cats. That seems to have been exactly what was needed, because now that Frankie is back at PAWS, he's settled down a lot, and his cute and fun personality is coming through. When he's not playing, he likes sitting in volunteers' laps and climbing the cat tree in his room. Kev and I really enjoy spending time with this playful and fun little dude, and we know he'll do well with whoever is lucky enough to adopt him! Houdini, the adorable orange and white cat who was nearly feral when he first came to PAWS, and who underwent a miraculous transformation to become the "official greeter of humans and felines alike" in his open cat room, is doing extremely well in his new home. We mentioned before that Reggie and Raisin, two of Houdini's old roommates, were adopted together. Their new dad wrote to say that the guys are doing great. He shared that "Reggie just swaggered out of the crate and took over." He also shared that even though Raisin has been a bit shier, he's also adjusting well and enjoys play time ... everyone seems quite happy. Look up the definition of "lap cat" in the dictionary, and you just might find a picture of sweet Ilona. That's why we're especially happy to tell you that Ilona has found some laps (and people to go with them!) of her very own. We'll really miss her! You may think that Ilona is a pretty lucky cat, but we think her new family is even luckier to have found her. So long, Ilona. We love you! By the way, our pal Kessa (aka "Teefa," because of those cute fangs) now lives in one of the "open" cat rooms at PAWS. She much happier now that she's not confined to a cage (and who wouldn't be?). Kessa always makes Tracey and I feel quite welcome when we visit the room ... she's quite fond of jumping into our laps and licking our hands (she'll also settle for an arm or even a head in a pinch...). Ever since they ended up in the same "open" cat room at PAWS, Valerie and Garth have been best friends. Tracey and I were lucky enough to capture the video below during a recent visit. As you can see, Valerie and Garth are extremely fond of each other ... as a result, we'd LOVE for them to be adopted together. Aren't they adorable? Kevin and I are ecstatic about some wonderful breakthroughs that Minnie is now making! I mentioned in my previous blog entry that this demure little kitty is a bit on the timid side. And even though she's still somewhat shy, she has recently taken a liking to coming out of her cage. Once Minnie's out, she revels in the attention lavished upon her by the volunteers. She loves being pet, and really enjoys it when Kevin and I sit on the floor with her. It's quite clear that she'd do really well in a quiet home, with people who understand her gentle nature. These remarkable changes in Minnie can be directly attributed to the consistent attention she receives from some volunteers who chose to work with kitties who need some extra special tender loving care. We can't wait until we see those folks at the shelter, so that we can give them a great big "thanks!” from Minnie (and us, too!). Today is National Feral Cat Day! 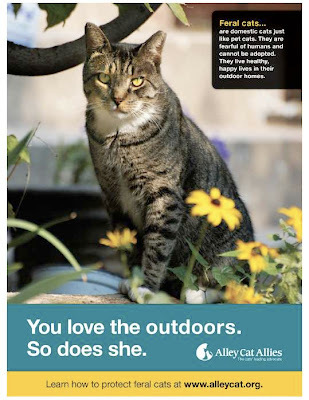 Now in its ninth year, National Feral Cat Day was launched in 2001 by Alley Cat Allies, the national advocate for feral and stray cats and a recognized authority on Trap/Neuter/Return (T/N/R) — the program wherein cats who live outdoors are humanely trapped and brought to a veterinarian to be evaluated, spayed or neutered and vaccinated. Friendly cats and kittens are put up for adoption. Feral cats that have undergone the procedure are released back into the areas from which they came, with volunteer caregivers providing a managed food source and monitoring the colony to aid sick or injured cats. PAWS has been -- and continues to be -- a strong proponent of T/N/R programs. Once a month, the shelter donates sections of its facility to FeralCare -- a local, all-volunteer group dedicated to T/N/R as the most effective way to help control cat overpopulation. FeralCare volunteers capture these outdoor kitties and bring them to PAWS, where veterinarians volunteer their time to perform the spays, neuters and vaccinations. According to the FeralCare Website, T/N/R is the most humane and nationally accepted way to handle feral cat colonies. Once neutered, unwanted yowling, spraying, cat fights and aggressive behavior toward neighborhood 'social' cats is reduced significantly. Undesirable behavior is averted, and no more kittens will be born. As the method is implemented, the feral cat numbers will gradually decline. The woman explained that she came to PAWS in search of a cat to replace her kitty who had passed away earlier this year. When she met Cherry, she absolutely fell in love with this sweet girl. The woman's adoption application was still being processed, and as such, she couldn't take Cherry home that day. But she resolved to call the shelter in a few days to find out if she had been approved. Over the next few days ... try as she might ... the woman just couldn’t get Cherry out of her mind. And then, while eating at a Chinese restaurant, she was surprised to read her fortune, which said: “He who seeks shall find.” You can imagine her amazement when the flip side of the fortune was a "Chinese word to learn" that translated into ... “CHERRY!" Was it destiny? Perhaps. Is it a truly happy ending?" Definitely! We love all of you, feline friends. Be well in your forever homes! Here's Bootz -- one of PAWS' most avid fans of "Cat TV" -- making himself comfortable. As you can see, this guy has continued to make tremendous strides since we last wrote about him. (Note: he looks pretty pudgy in this picture, but in actuality a lot of it is fluffy fur...). Hail to one of the sweetest cats to ever set foot in PAWS! Pharaoh -- a gentle cat who came to PAWS when his owner passed away -- is the type of cat who blends in with the crowd. Blending in isn't a bad thing, but in this case it means Pharaoh doesn't have the kind of personality that stands out when you first meet him. It's times like these that the work of the volunteers is even more important. We get to know the subtle nuances of a cat through regular interaction and can offer up this information when called upon by an adoption counselor. It can make all the difference in the world, and help to create the "perfect match" between adopter and pet. Kev and I are continuing to get to know Pharaoh, and can't wait to share our updates about this wonderful boy. That's why I'm especially excited to report that Eden has made tremendous strides since he's been at PAWS. Once he got past all of the new sights (other cats? yikes! ), smells (other cats? yikes!!! ), and sounds (other cats? and dogs, too? YIKES! ), he was able to realize that the humans in this place spoke gently, moved slowly, and offered great things like love, pets ... and food! Over the last month or so, Eden and I have struck up quite the friendship, and we both enjoy our times together. Eden loves being talked to softly and is a huge fan of being pet. Every now and then, he even throws in a few "head-butts" to show his appreciation. This handsome fellow is about 4 years old, neutered, and current on his vaccines. He's grown so much, and I know he'll be a great and loyal friend for the human who adopts him. If you've got a quiet home with no other pets or small children, Eden might just be the cat for you. Max and his cute spotted nose are about two years old. Like all of the animals at PAWS, he is neutered and up-to-date on all his vaccinations. Snowball, the adorable all-white, short-haired, mellow cat that we wrote about back in January 2008 has made some great progress that we'd like to share with you all! Oh, by the way ... the kitty standing near Snowball in the first picture is Reggie, who must be wondering, "Great ... I finally got Houdini off the Scratch Lounge and now I have to deal with Snowball hogging it ... what's a sweet boy like me to do?!" We have great news, and we're practically bursting at the seams to share it! A number of our feline pals at PAWS -- including some previously mentioned here in our blog -- have recently been adopted! And although we'll miss seeing them, it's wonderful to know they've finally found "forever" homes, with places and humans they can call their very own! Morgan and Chandler, the sweet brothers who were returned to PAWS when their owner was no longer able to take care of them. It was clear these two gentle boys were very fond of each other, which makes us incredibly happy they were adopted together. Be well in your new homes, kitty friends. We love you! Well maybe not a love story but certainly a "really like" story! Garth, who is new to this blog, is a 2 1/2 year-old domestic long-haired black & white kitty. He's quite handsome, but is a little shy and would do really well in a quieter home with dogs or other cats. Found as a stray and brought to PAWS in early May 2009, Garth has quickly made friends with Valerie, a kitty previously covered in our blog. Kev and I often find them sleeping together on the stuffed chair in their room, sitting and rubbing their heads together, or walking side by side. Oh, Happy (World Cat) Day! 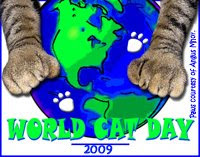 Happy World Cat Day to kitties and their friends everywhere! If by chance you don't have a cat, but are thinking of getting one ... please consider adopting one from your local animal shelter or rescue organization. You (and the kitty you save) will be glad you did. 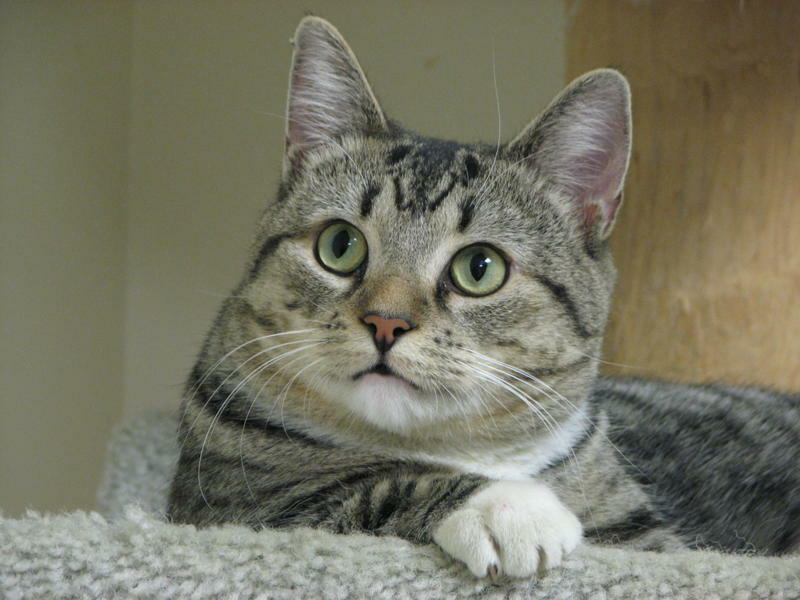 "Thurman is a great cat, enjoying the larger house and is running around. He gets along very well with his new brother—it only took them two days! Thurman sleeps on his dad's bed and both kitties sleep on the couch together." Good for you, Thurman! We love you, buddy!